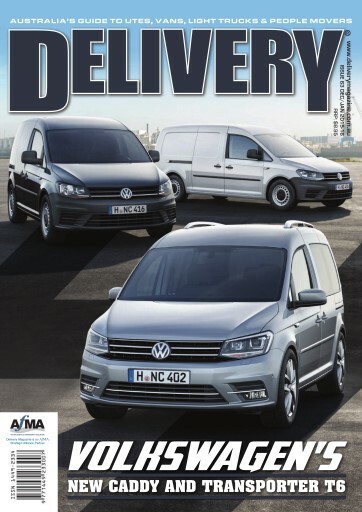 Issue 63 of Delivery magazine (on sale December 3) gives our readers the opportunity to share with us some of the new and exciting events taking place in the world of light commercial vehicles. Join us as we review how Mercedes-Benz and Volkswagen are completely revitalising their product ranges and setting the tone for some really interesting new products for 2016. Our extended evaluation of the award winning Renault Kangoo shows how the Maxi Crew version is so amazingly versatile, offering seats when you need them and extra load carrying ability when you have to shift bigger cargoes. The Vito and V-Class encompass the very highest safety levels expected from Mercedes-Benz and with new engines and a choice of front or rear wheel drive models the opportunity exists to fine-tune your choice of model to fit the work task. The new Volkswagen Caddy hits Australian roads before Christmas, coinciding with the release of the all-new Transporter T6, the culmination of a 65-year product history. As well as all the activity in the van sector, the ute segment is equally active. The latest versions of the Ford Ranger and Mazda BT-50 are particularly attractive, not only for the 3.2 litre, five cylinder performance when it comes to towing, but also for Ford being the first ute manufacturer to offer adaptive cruise control, lane departure assist and other safety features. Challenging Ford, Mazda and Mitsubishi sees Nissan launching the remaining models of its new Navara range, adding leaf-sprung variants to the coil sprung ST version. All the details on the expansion of the Nissan Navara range will be in our January edition. In this issue we test the latest twin rear wheel Renault Master and find it has a lot to offer, with easy access and good on-road manners.